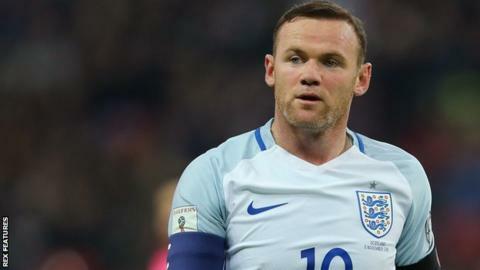 Captain Wayne Rooney has "unreservedly" apologised to interim England manager Gareth Southgate after pictures emerged showing him at a wedding at the team's hotel while on international duty. A statement issued on behalf of Rooney, 31, called the images "inappropriate". The Sun published images it said showed Rooney drunk at a party late on Saturday night - a day after England's World Cup qualifying win over Scotland. The FA, meanwhile, says it will review its policies around players' free time. Thursday's edition of The Sun claims that policy review was launched because 10 England players were at a nightclub until 04:30 GMT on Sunday. The statement from Rooney's management continued: "Naturally Wayne is sorry that pictures taken with fans have been published. "Although it was a day off for the whole squad and staff, he fully recognises that the images are inappropriate for someone in his position. "Earlier today Wayne spoke privately to both Gareth Southgate and [FA technical director] Dan Ashworth to unreservedly apologise. "He would like to further extend that apology to any young fans who have seen these pictures." Rooney missed Tuesday's 2-2 friendly draw with Spain with a minor knee injury. Rooney's apology came as the FA issued a statement saying "England personnel have a responsibility to behave appropriately at all times". The governing body added: "We will be reviewing our policy around free time while on international duty."